The part of the Eastern Promenade Trail that washed away in last week's accident will reopen Wednesday. Last week’s spill damaged this portion of the Eastern Promenade Trail and sent about 1.69 million gallons of partially treated wastewater into Casco Bay. 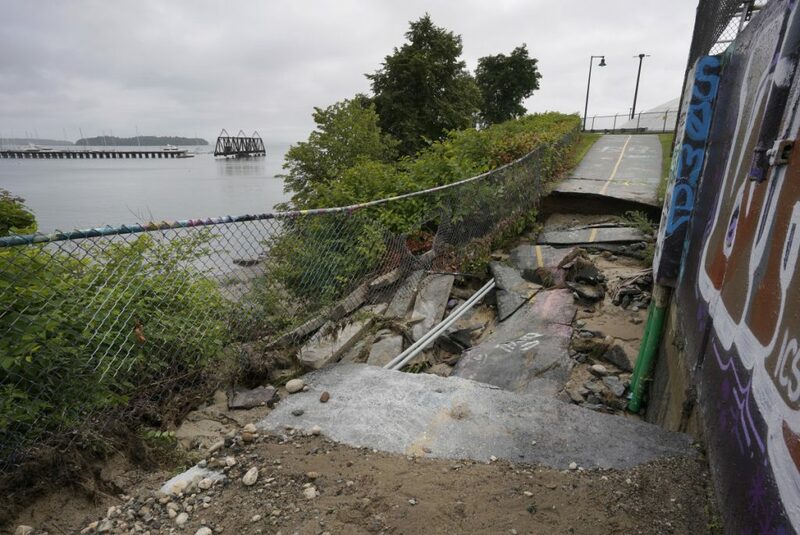 A report prepared by the Portland Water District says human error caused a large wastewater spill from its treatment plant that washed away part of the Eastern Promenade Trail last Thursday morning and flowed into Casco Bay. The report also says more than 1.5 million gallons of wastewater spilled, not the estimated 1 million gallons reported initially. Jessica Grondin, spokeswoman for the city of Portland, said the trail would reopen Wednesday. In the district’s incident report, which was filed with the Maine Department of Environmental Protection Tuesday, a chlorine contact tank started overflowing around 4:25 a.m. on Thursday morning. Scott Firman, director of wastewater services for the district, estimated in the report that 1.69 million gallons of partially treated wastewater spilled, flowing down an embankment and entering Casco Bay. Staff at the plant in Portland’s East End plant had cleaned a chlorine tank at the plant on Wednesday and had partially opened a valve to allow the tank to slowly fill with effluent. The operator did not return to “fully open the inlet gates,” the report said. On Friday afternoon, an initial water test showed elevated bacteria levels. The results of the first sample taken Thursday morning found 160 colony forming units of bacteria, or cfu, per 100 milliliters of water. The state beach closure limit is 104 cfu per 100 milliliters of water, the city said. Michelle Clements, spokeswoman for the water district, said repairs to the trail and treatment facility cost between $30,000 and $50,000. The Maine Department of Environmental Protection could fine the water district after a review of the incident. However, the DEP had not done so as of Tuesday, Clements said. The district was required to file an incident report within five days of the spill for the DEP to review. The spill, which forced the city and water district to temporarily close East End Beach, was the largest ever at the treatment plant, Clements said at the time.